W elcome! Here is the fourth and final book in our special extended series, The Quest For Immortality. At the end of Paths of Deception things looked bleak for our favourite couple as Zelda discovered Link in a clinch with his old friend Fayzie. When they should be working together to prevent tragedy in Hyrule, the pair are apart, each taking matters into their own hands. Link goes after Robert to try and prevent a Catalian invasion, whilst Zelda attempts to track down Mara. 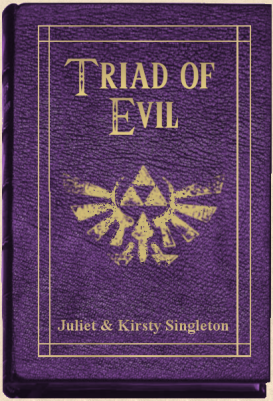 Can they do it alone or will it take more to stop the Triad of Evil; Robert, Mara and Enzar, from achieving the Power of Gold and taking over Hyrule? Feeling ultimately betrayed by her husband, Zelda can do nothing but banish him from North Castle, leaving her heartbroken and distraught. Catalia have sent word to Hyrule that they will invade, on false claims that Link murdered Queen Seline. While King Harkinian makes plans for defence, the princess decides she has to put a stop to Mara's evil plans, and together with Sprite sets off for Death Mountain to defeat the wicked sorceress. Feeling he has nothing left, Link returns to Catalia to try and sway his old kin Robert from declaring war on Hyrule. However Robert is intent on invasion and throws Link in the dungeons, mobilising his army and setting sail for Hyrulian shores. Link escapes luckily to find an ally in an old friend of his father's; Orion Beyblade. Fayette meanwhile plans to marry her beloved Kendar Hartrend. But each is to face an unexpected twist in the shape of one being they never imagined still existed; Enzar. In the thrilling conclusion to the series, will Hyrule finally fall to the greed and power of Mara, Robert and Enzar?